Over the years my sewing career has taking me in all different directions. 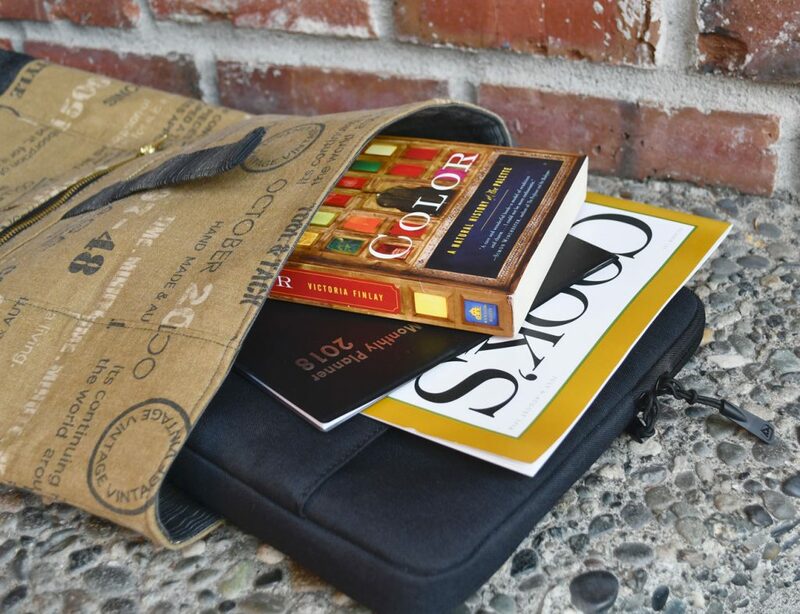 I started out as a quilter and quickly expanded my horizons into small home dec pieces and bags/purses. I continued to evolve and left most of this small-piece sewing behind for my new love, garment sewing. After years away, this spring I dipped my toe back in the bag-making waters and let’s just say I fell in the deep end. It all started this past February in preparation for our booth at Sew Expo. 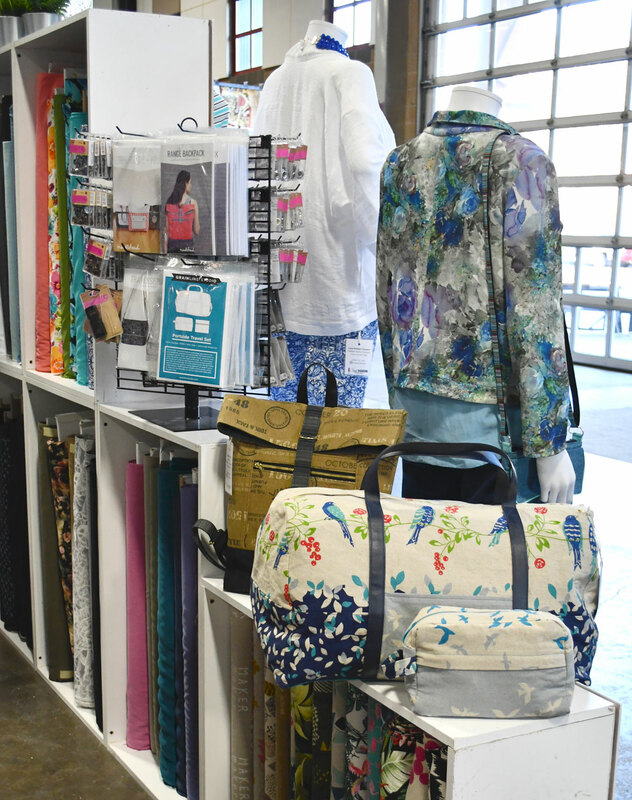 We wanted to add a few handbags to help complete our outfits on display and to have around the booth, so we decided to sew up several of the amazing patterns from Noodlehead. After seeing loads of inspiration on Instagram, I definitely wanted to sew up the Range Backpack. Uniquely functional and stylish, this was a project I knew I would get a lot of use from after the show. Now the only problem was picking out which fabrics to use! After taking up the whole cutting table laying out different fabric pairings I finally settled on a vintage-inspired stamp print canvas from Japan. I just love the sepia color and the distressed look! For the bottom I picked a washed black denim that both complemented the vintage look of the canvas and would hold up well over time. And for the straps and lining I picked kind of an unconventional choice… a stripe shirting. A shirting? 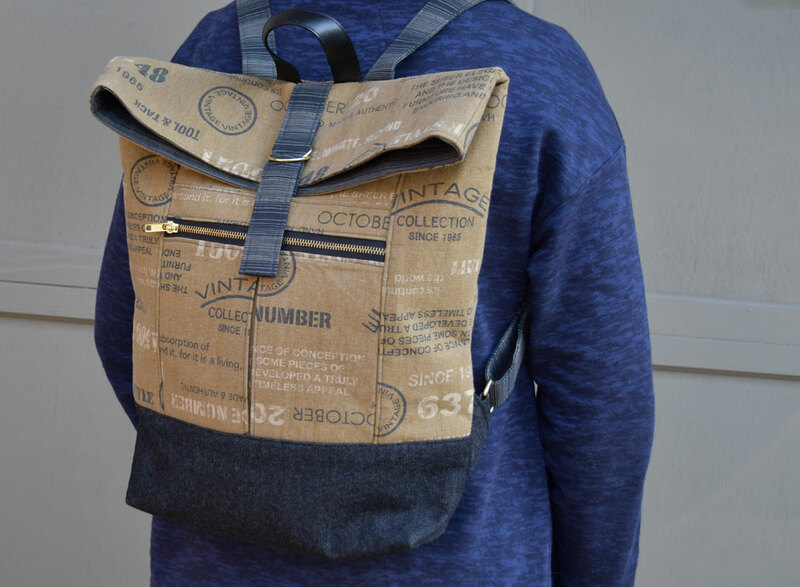 You are probably thinking how could a shirting possibly hold up well on a backpack. Shirtings offer a nice tight weave making them quite durable and once you interface, fold (4 times!) and top-stitch those straps aren’t really going anywhere. I also loved the way this stripe looked. With just that hint of metallic is was a perfect pairing for my other fabrics and metal hardware. To make things even easier and to add a faux leather detail, I picked a pre-made stapping for my top handle. Now for the fun, and addicting part… the sewing! I broke up this project over two evenings. The first night I cut out ALL of the pieces and interfaced them according to the directions. There are a lot of pieces, so one recommendation I have is to photo copy the cutting instructions and highlight or cross-off as you go. Anna (Noodlehead designer) was thoughtful enough to include labels you could cut out and might find helpful. The next night I sewed my whole Range Backpack together. 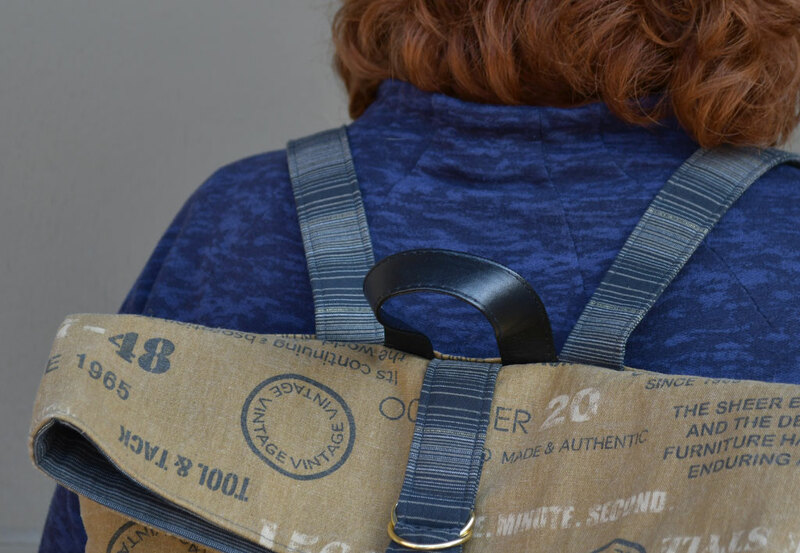 Anna provides amazing step-by-step instructions and clear illustrations in all of her patterns and this backpack is no exception. She really knows the ins and outs of bag construction and this is clearly shown in the finished details. Be sure to follow her instructions exactly! You may think a step is totally crazy and backwards but believe me it will be bag-making magic. The pieces all come together in the end with minimal top stitching to finish off your project. Just have faith! My only issue with this whole project is with how the straps lay. In the pattern it has you install the straps straight lined up with the handle and closure strap, which is how I did it on my first backpack. When your bag is on your back the straps do this little lift/twist where they attach at the top. You can see this a bit in the photo below as well as on the pattern cover itself. By angling the straps just slightly when they are installed, this is eliminated. See the change below in the differences between my first (top) and second (bottom) bags. Just a slight change that made the appearance of the straps look even better! After this you can probably see why I love this backpack. 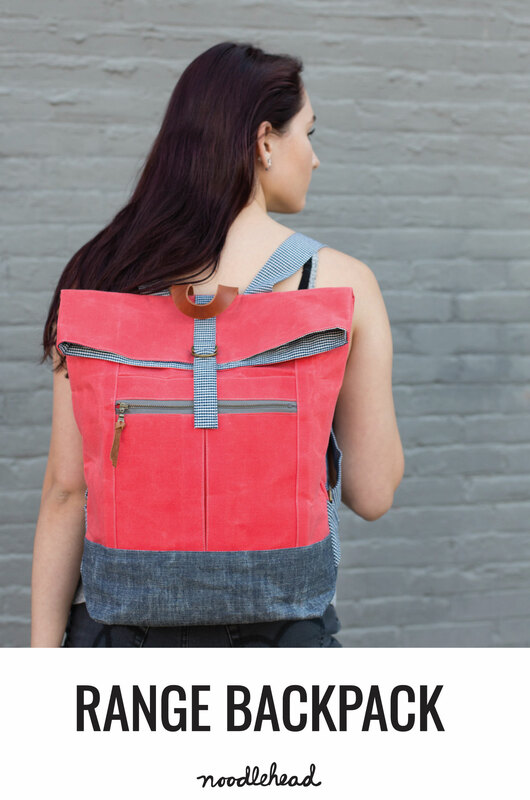 Truth be told, I finished my first Range Backpack and loved it so much that I cut out another one that night and sewed it the next. Yes, two backpacks pretty much over a weekend. I might even have fabric pre-washed for another… Hello, my name is Michelle and I have a Range Backpack problem! 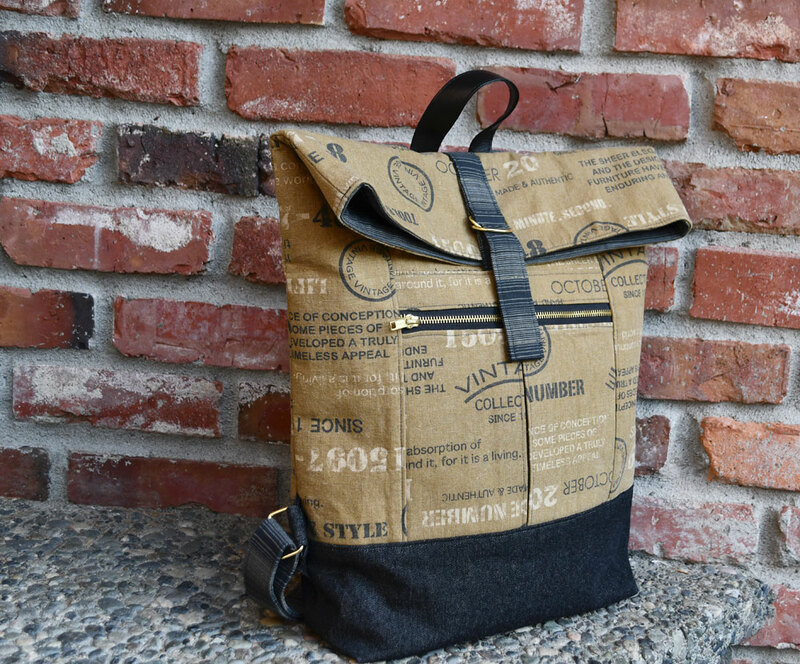 For those of you that haven’t experimented with bag making yet you should! There may be a lot of pieces and you have to be organized but the results are so rewarding and you will not be disappointed. 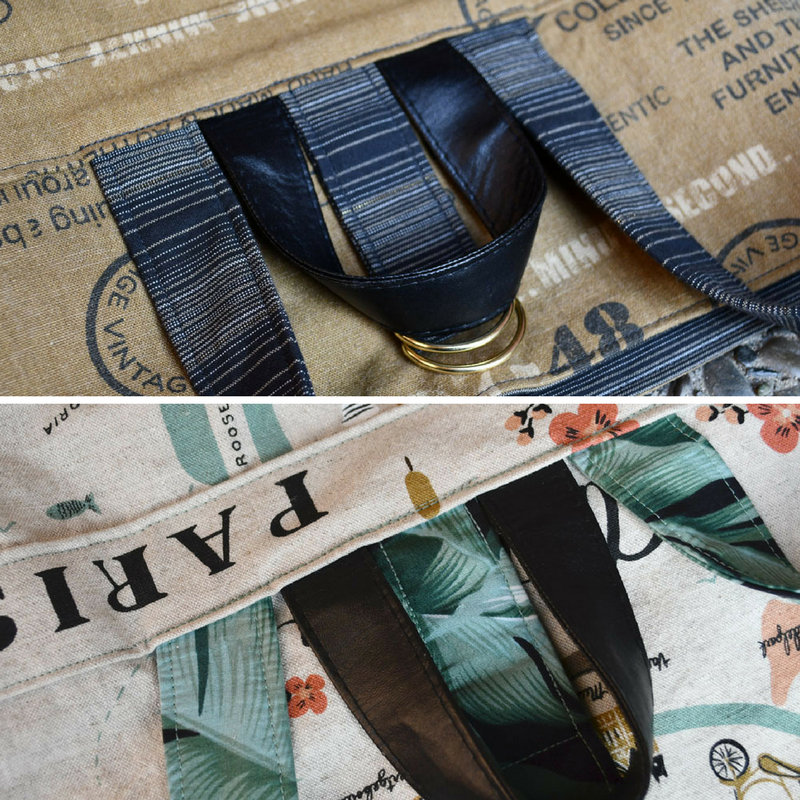 Watch for lots more bag making inspiration coming to the blog over the next couple of weeks! 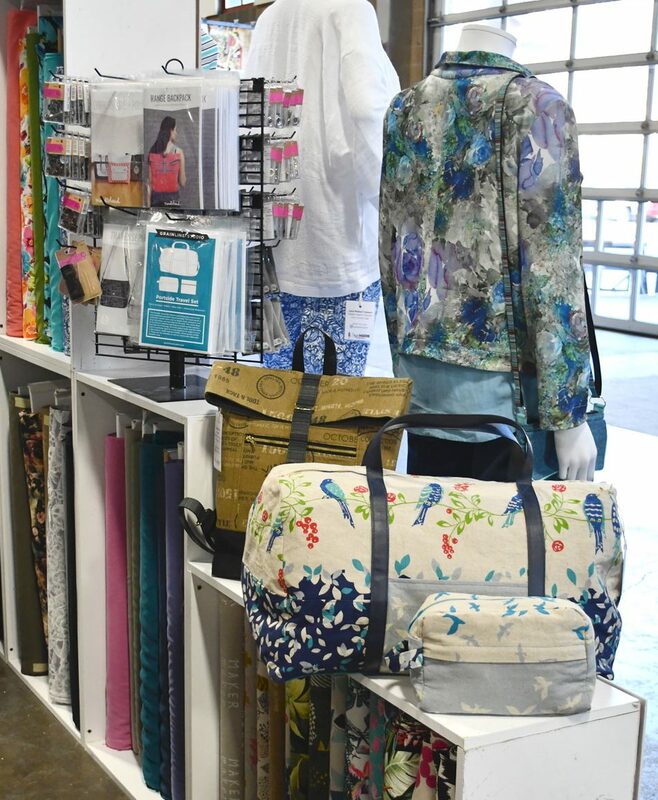 Also, be sure to check out our revamped accessory category with all of the patterns, hardware and fabrics to help make your own projects a huge success. LOVE – LOVE – LOVE!!! 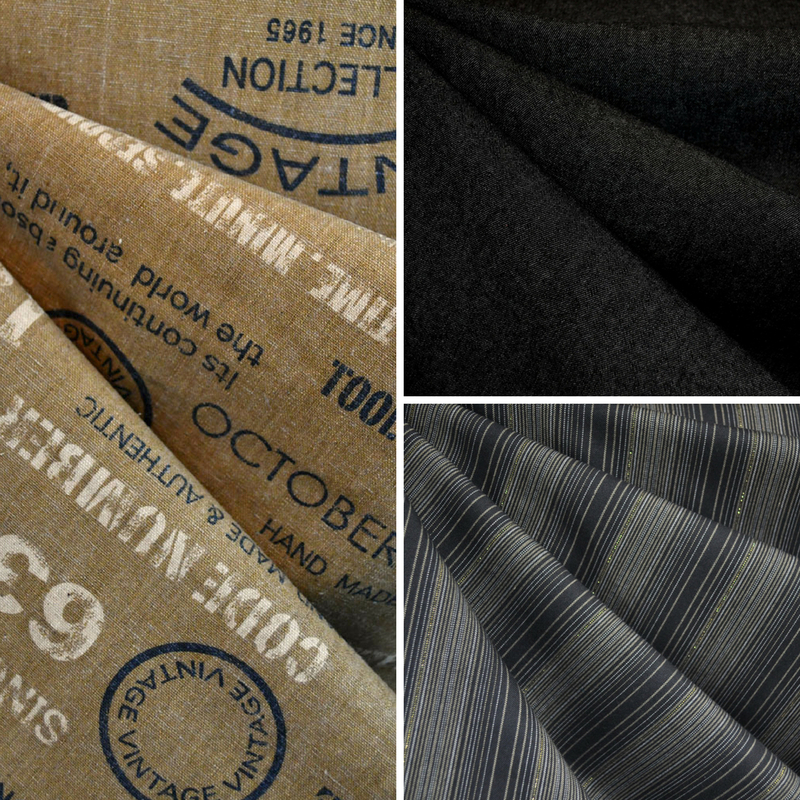 What did you use for interfacing? 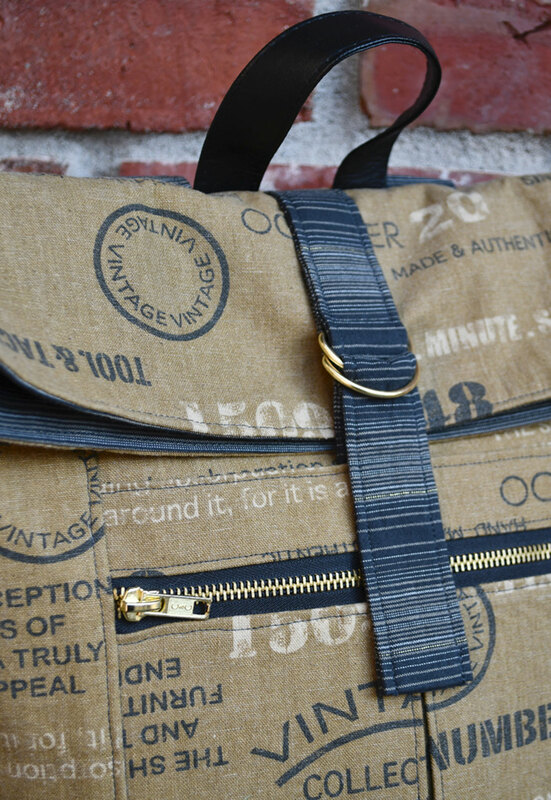 I love this bag, your fabric choices are perfect! Loving the Ranger but the duffle also caught my eye in the photo. Is it by chance the Grainline bag pattern I also spied? Fabrics? As a gardener, I’d love a travel set like that…oooeee! The Ranger looks fun, but so does that little bag on the watercolor jacket mannequin. Is that a fabric strap? What pattern is that one? I love this bag. Me and 2 of my friends bought all the stuff to make it exactly like yours at sew expo. I have finished mine and i did change 1 thing as well, i gave it a clip closure. I knew I didn’t want to thread those straps through the d rings every time I needed in the bag… ive had many offers to buy it. 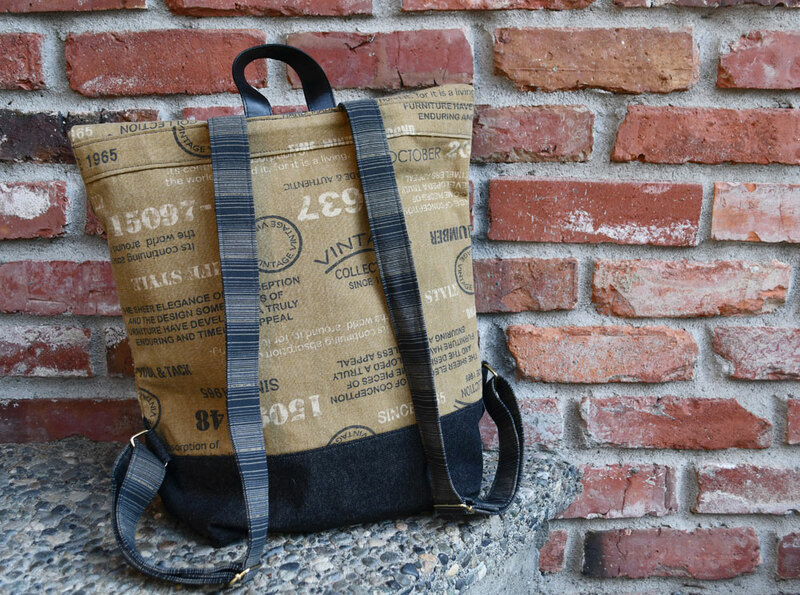 Its a great bag, i love the fabric. Both my friends have yet to take their fabric out.of the sack and begin sewing….